Last weeks Ben and Holly Little Explorers theme was all about fruit and vegetables and I have to say I was rather surprised at some of the facts. Did you know there are over 1000 types of apples? There was me just picking between red or green apples. Apparenty lemons contain more sugar than strawberries. So tell me why do they taste so sour? Eating a lot of onions can make you sleepy. Perhaps this is what I need to be eating in the evening to help me get to sleep. 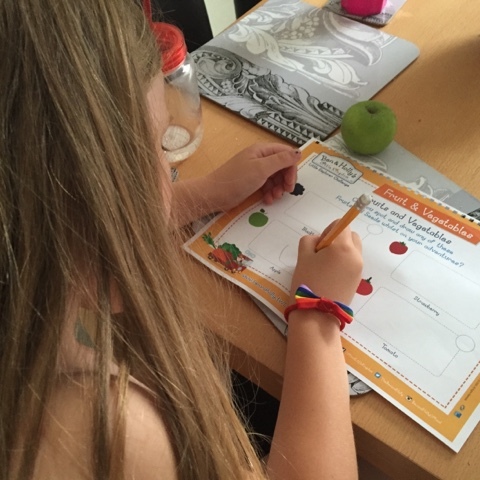 We may have cheated when it came to spotting and drawing the fruits we were asked to find because we found them all in ….. our fridge. Ok we didn't look very far but in our defence it has been particularly rainy of late. 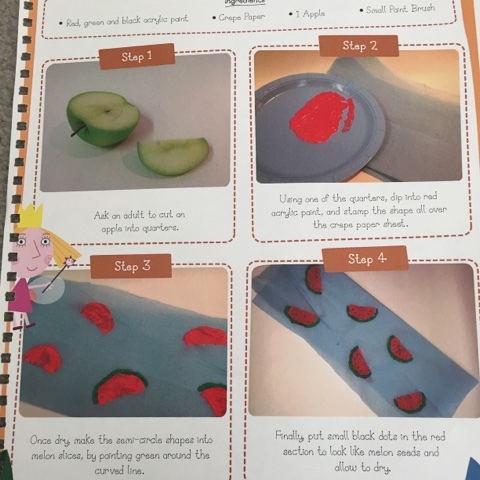 And just incase you've had a lot of rain instead of sun, below is a little fruity activity you can do with your little ones to keep them entertained. This weeks little explorer theme is elves and fairies (I've been looking forward to this). It isn't too late to join in so why not check out the activities you and your children can be taking part in over on the Ben and Holly website.